Why did I buy this car? Well, because they have always made a great impression on me. Having owned a first-gen hemi 5.7-litre, I regretted the day I traded it in for a Hyundai Santa Fe. Although the Santa Fe was a good car, I missed the power and the creature comforts my Chrysler provided. I’m also a professional car detailer by trade, so having a pretty rare car that is super-well looked after seems to do well for business with potential clients. Fuel economy is not something you look at when buying a big 6.4-litre monster but surprisingly, the 300 is exceptional with cylinder deactivation and daily 70 per cent freeway driving (25km trip), the car is at 12.8-litres with around 5000km on the clock now. Inside the cabin is a sensational place to be with quality materials throughout. Outside is just as good apart from one slightly misaligned panel, pretty good from an American maker, although the car was actually built in Canada. Power is phenomenal when you need it. Plant the foot and it’s just an animal unleashed. Traction cannot keep up at take off in standard default mode! Sport mode is just about perfect with suspension becoming slightly firmer along with steering and don’t forget the shorter gear shifts from the eight-speed ZF transmission. Track mode and well…. things become very stiff with the adjustable dampers doing their thing, a little too harsh for me, to be honest. I keep it mostly in default mode. For a two-tonne car it handles very well and is nowhere near as boaty as my first-gen 300. Without going too in depth about safety, the SRT has everything and more than required. Blind-spot monitoring is something new for me and I appreciate that one a lot but I don’t solely rely on it. 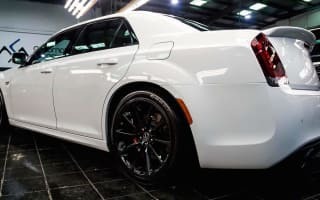 Rear-view camera, airbags et cetera are all things you come to expect these days from automakers and the Chrysler 300 SRT ticks all the boxes. All the creature comforts like heated/cooled seats and cupholders are all very welcome, too. Bang for buck, this is the best V8 money can buy. Oh… and that sound! For a factory exhaust this is the best sounding V8 on the market by a long shot. Remote start in the early mornings is no doubt disturbing my neighbours but even they appreciate the vehicle so much they don’t complain and love seeing and hearing it when I am leaving or arriving home. A very nice burble at idle lets everyone know you have something quite menacing if required and give it a bit of throttle and they would certainly know you’re not in the hybrid or electric camp. Chrysler has done a wonderful job on this car and kudos to Ralph Gilles and the team at Chrysler for designing a wonderful car. The only thing I would change on the car is the park brake. Foot assisted park brake is outdated and should really be electronic these days. Reliability is too hard to judge given its early days into my ownership but if it’s anything like the first-gen I had, I will be a happy man!